A Double bill of compelling, contrasting contemporary ballet with an exciting original soundtrack, stunning imagery and an exceptional international cast. The last astronaut has left a dying earth in search of a new home. In a thrilling cascade of stunning characters, costumes and imagery, he witnesses the birth of a new star and finds himself on an alien world, populated by very alien creatures! This extraordinary ballet combines an exciting original soundtrack with contemporary ballet danced by an exceptional international cast. Through the fascinating choreography the dancers interpret cosmic events, from the evolution of a star to the formation of a deadly black hole. Life is a harsh game – sometimes it’s difficult to win with the hand you’re dealt. But is it actually about how we play the game? 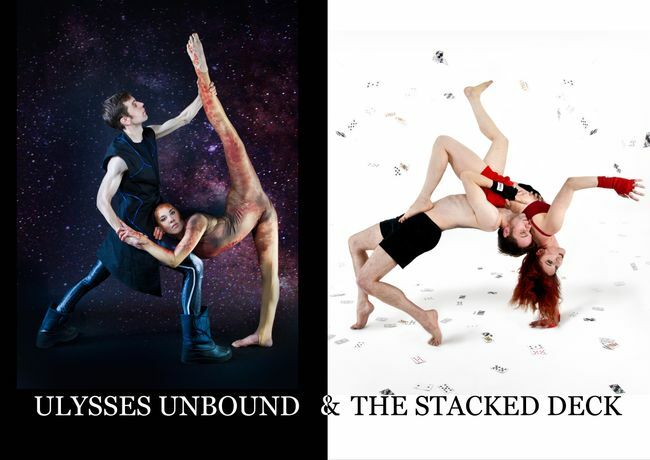 Inspired by the concept of Game Theory and the theme of equality, ‘The Stacked Deck’ is a contemporary ballet based on a combative game of cards which four players are all desperate to win. Each time a hand is dealt, the players are given a different scenario to face. How they chose to play their hand will determine the final prize. Intense, raw and gripping, with the dancers radiating primal physicality, this ballet challenges us to look at how we all play the ‘game’. Included in the evening is a short post-show talkback with the company. Chantry Dance Tour-related workshops, suitable for schools, colleges and dance schools, are also available – please contact education@chantrydancecompany.org for details and bookings.